The Flinders Hotel has a bit of history, dating back to 1889. However, it has recently been revamped, and now includes the more formal Terminus restaurant, The Deck (a casual pub), and a function area, as well as a 40-room boutique hotel (scheduled to open in September). I'm also told that there are plans in the works to turn the site across the street into a cooking school - all of which I'm sure will make Flinders quite the destination! Lunch started with some warm and fluffy bread rolls, studded with nigella seeds. 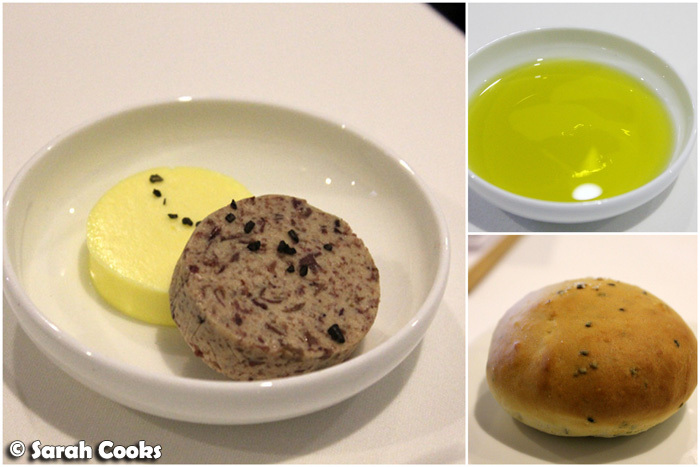 I particularly liked the olive tapenade butter that came as an accompaniment. 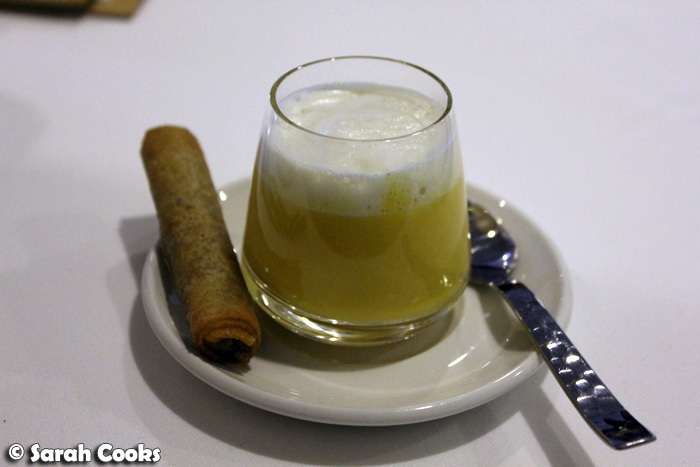 We were also given an amuse bouche of butternut soup with aniseed foam, and a crisp mushroom borek. I don't always like aniseed flavours, but it complemented the sweetness of the soup well. And who doesn't love deep fried pastry? 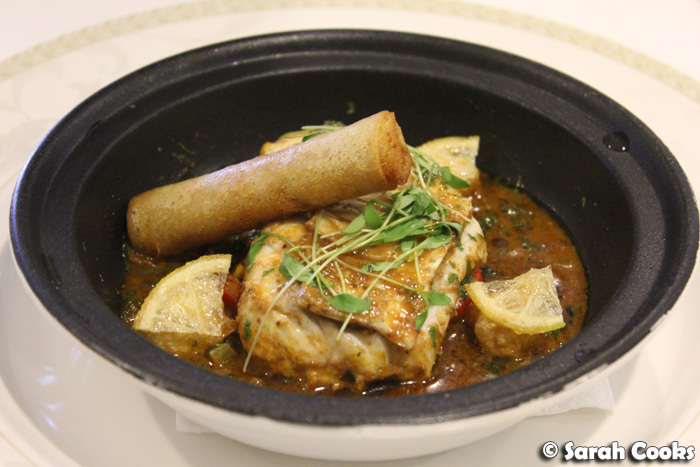 The menu has a distinct north-African vibe, influenced by the Algerian heritage of Chef Pierre, who kindly arranged to have a series of dishes brought out so that we could try a good selection of the menu. I haven't listed prices in the captions below, as I wasn't sure if some of the portions were downsized for tasting purposes. However, to give an indication of price, entrées range from $24 - $27; mains are $34 - $39; sides are $9.50 and desserts are $14 - $17 ($26 for cheese). For our first course, we were each given the stuffed quail leg. It was my favourite dish of the day - and it certainly induced a lot of envy when I tweeted it! 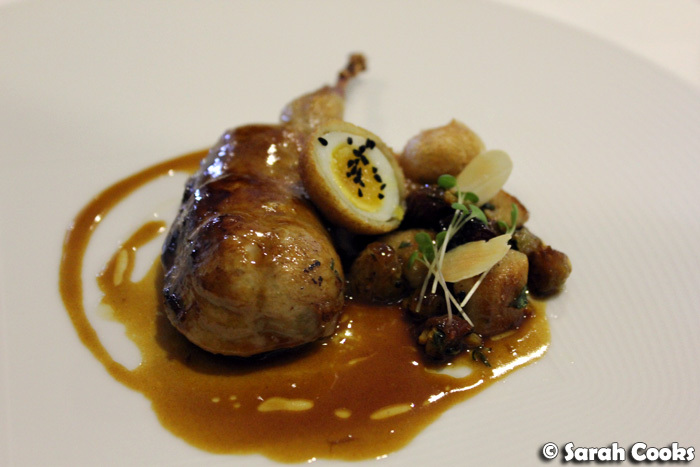 The boned quail was tender and juicy, and I loved the combination of sticky, savoury sauce, sweet raisins, and the hint of cinnamon in the gnocchi. And how cute is the quail egg on the quail leg? (It also sounds funny when you say that out loud, hehe). For the next two courses, we were each given a different dish. 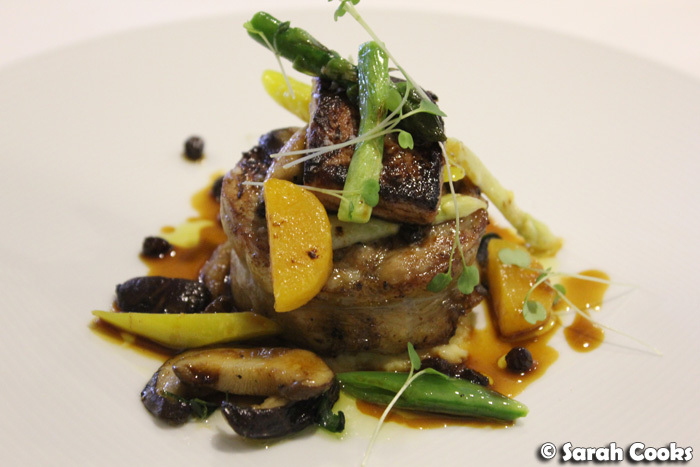 It's quite decadent to have foie gras at lunch, but I'm sure it would have been rude to say no! 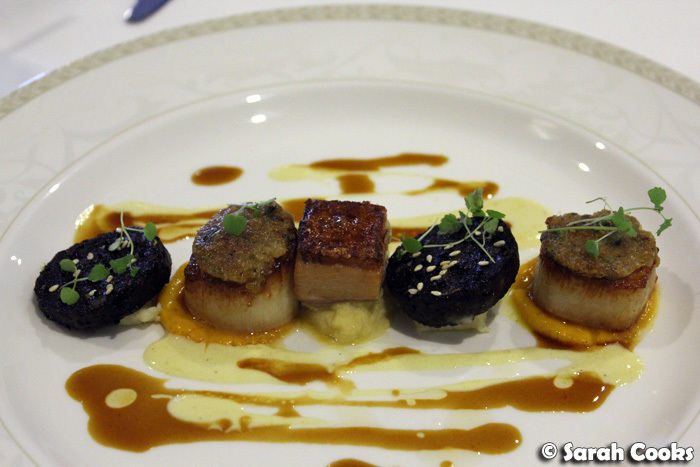 I really enjoy the combination of black pudding and fresh scallops, and the cube of crackly pork belly took this dish to another level. I think of this dish as "a study in lamb", with lamb rack, shoulder, and Merguez sausage. This was yet another dish featuring meat and the sweetness of raisins, which is a totally winning combination in my book. Love! The snapper was incredibly fresh and perfectly cooked, and I enjoyed the crunchy shrimp borek (more deep-fried pastry - win!). The chermoula-based sauce was very strongly flavoured - both salty and sour - and if this hadn't been such a filling meal, I'd have loved some plain couscous to soak up the sauce and temper the sauce's intensity. Looking back over this meal, I see it was quite meat-heavy. Based on the quality of the food we ate, cooking with meat is obviously one of Pierre's strengths, and in fact, the current menu online only lists two vegetarian entrées and one vegetarian main. Not that this bothers me at all (of course not! ), but I just mention it as it's something you might want to keep in mind if you're visiting with a vegetarian or someone who doesn't eat a lot of meat. Needless to say, we were very full after that generous meal, but just had to order a dessert to share - for research purposes, you understand. 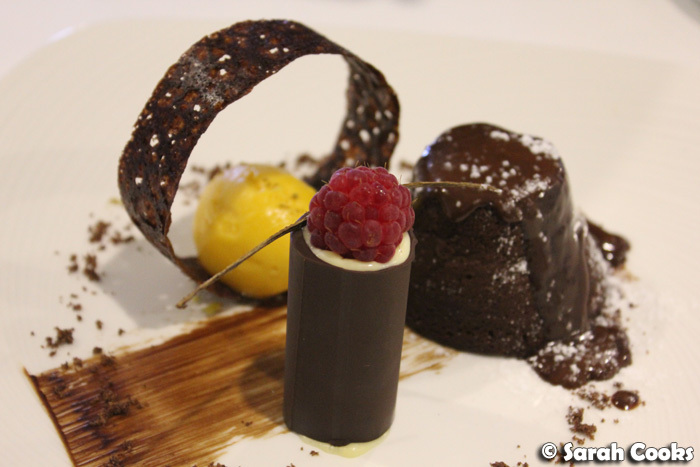 Of course I loved the warm, molten chocolate fondant, and the sweet lightness of the white chocolate mousse, but what really stood out for me was the butternut sorbet. Such an unusual flavour, and so delicious! I wouldn't have thought to pair dark chocolate and butternut pumpkin, but it worked so well together! 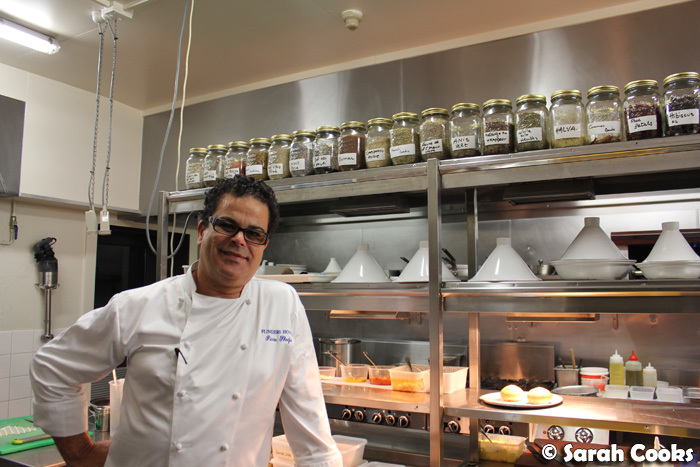 A big thanks to Chef Pierre Khodja for a lovely meal! 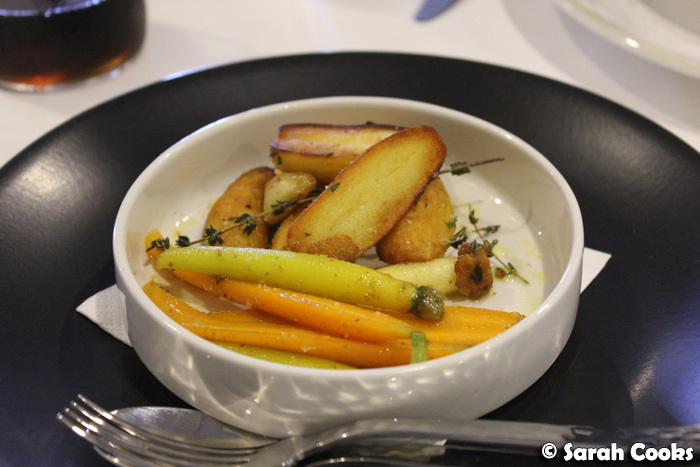 Sarah and Sandra ate lunch as guests of the Flinders Hotel and Mornington Peninsula Tourism. 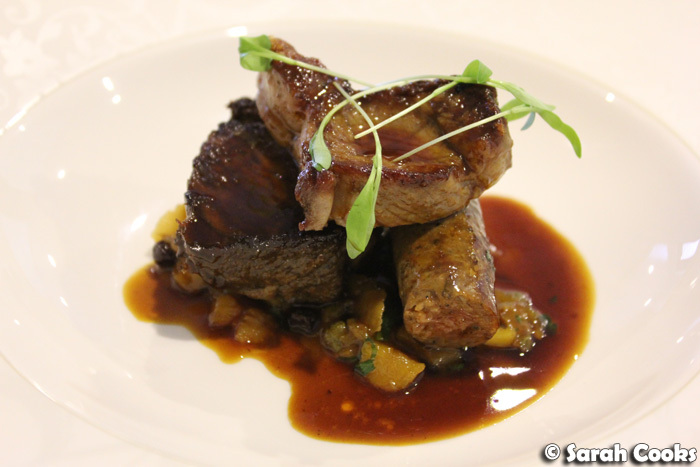 This is the fifth and final post from my 2012 Mornington Peninsula Trip series. Other posts include: Mornington Peninsula; Montalto; Tussie Mussie Vineyard Retreat; and Stillwater at Crittenden. Meat + Chocolate = Decadence overload. Hehe. I never had nigella seeds before. I wonder how it will taste like. I'm kinda imagining the olive tapenade butter melting over the roasted kipfler potatoes and it's kinda making my imaginary world happy. 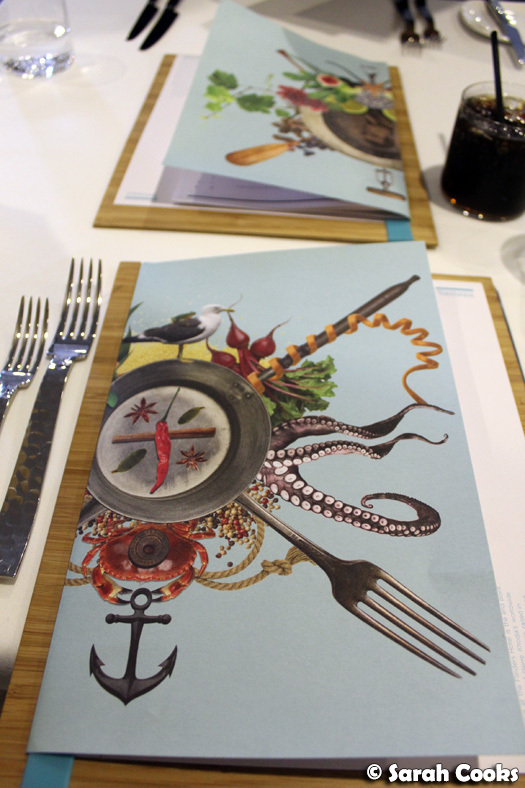 What a nice menu cover. 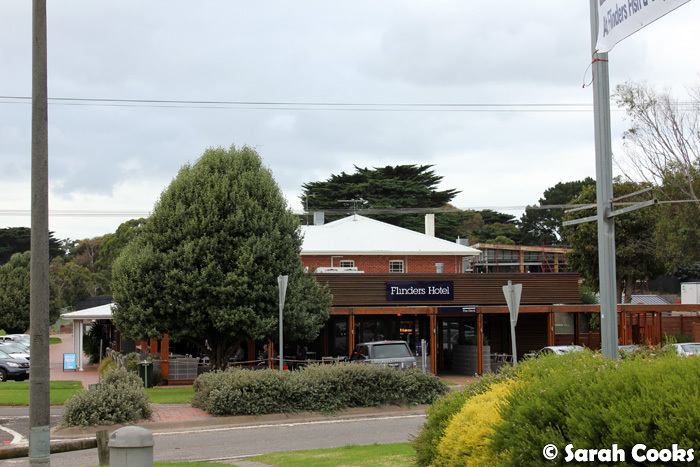 When I hear "Flinders Hotel" I think pub food too so it must have been a nice surprise to see all the lovely food and presentation! Hannah - Ooh... that sounds like a fab idea! AMAZING! I have a soft spot for restaurants with a history... I REALLY want that quail dish now. Absolutely perfect in every way! Thanks for sharing this beautiful post! The wines and cuisines which you have talked about are really wonderful and people who will visit Mornington Peninsula will enjoy these dishes.